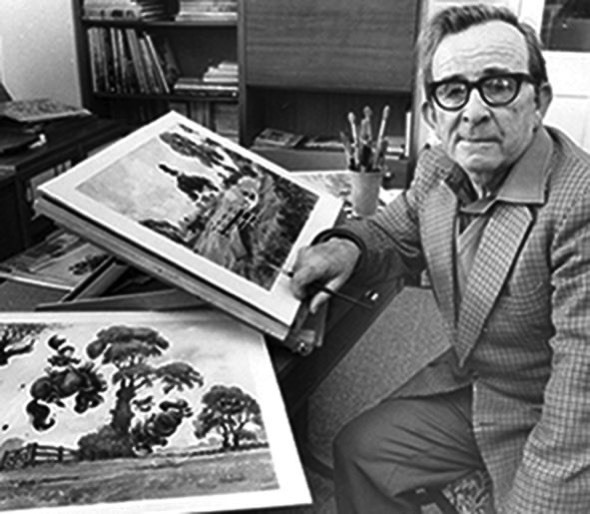 Norman Thelwell was internationally renowned for his cartoons, particularly of horses and horse riding, but he was also an artist, an angler and a passionate countryman. He was born in 1923 in Birkenhead and grew up 'a town child' with the countryside as 'a glimpse of paradise' just a penny bus ride away. It was at nearby Raby Mere that he began fishing for 'jackies' (sticklebacks) but fishing was always more a means of spending time in beautiful places than making a catch and in that respect he can be ranked along with other great angling writers like 'BB' and Bernard Venables. Raby Mere made a lasting impression on him: 'the shining mere with its boats and the more-than-happy white ducks that need never leave its water. I used to imagine myself one of those ducks on Monday mornings. How they must hug themselves with the warm arms of privilege as they floated serenely on the wide mirror or rested their heads over their snow-white backs and dozed away the gently rocking hours whilst men and women worked and children quaked through the drudging school hours'. Thelwell left his grammar school at 16 and took a job as a clerk until the war and conscription intervened. He was called up to the East Yorkshire Regiment at the age of 18, and was posted for a while to India where he became art editor of the Indian Electrical and Mechanical Engineers' Journal. It was there that he contributed his first cartoons to the Forces magazine Victory. Realising that art could earn him a living, when he returned to England after being demobbed Thelwell studied at Liverpool College of Art, taking a teacher's diploma. He spent six years teaching before the success of his cartoons in Punch and the News Chronicle enabled him to draw and paint for a living. In 1959 he moved to Hampshire with his wife Rhona and two children, Penny and David, buying a cottage with river frontage. However, on discovering that he couldn't actually see the water from his window he decided that the only option was to bring the water in, and so began the major project which is the focus of A Plank Bridge by a Pool in which he creates a pool, three little islands, a boathouse and some bridges and observes with delight the wild life that is attracted in - the lively fish, coots, moorhens, ducks, swans, geese, herons, cormorants and many others. This book was first published in 1978 and has been republished by Medlar with additional colour paintings and a note from the author’s son David, who grew up at Heron’s Mead. This book evokes the quiet pleasures and the hilarious escapades that characterised his life at his cottage, Heron's Mead. It is a portrait, in words and pictures of a garden in rural England that became a wildlife sanctuary. It is also the story of how one man realised a childhood dream. Norman Thelwell died in Hampshire in 2004.